I still see the content in black and white, rather than the coloured syntax as vim LongClass.java. It depends on how you are doing syntax highlighting. If you have autobuf rules based on file extension, it won’t recognize the file from stdin. I don’t have a java file lying around, but I tried piping a python file into ‘vi -‘ and it was highlighted correctly. @bobby is right, you need “filetype plugin indent on” for detection to work. for java … I’m afraid you’re out of luck. I went through scripts.vim (which looks inside the file to decide the filetype) and I guess there’s no easy hook to decide it’s java and not something else. 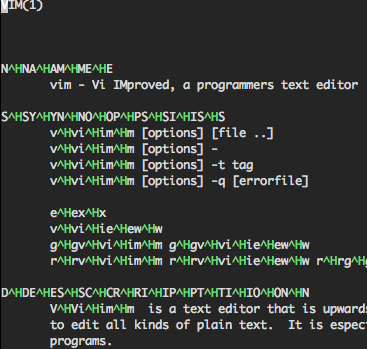 Inside vim, however, you could type “:set ft=java”. This is definitely not optimal, but it depends on what you’re trying to achieve. With filetype plugin indent on, it seems the only file types that didn’t have syntax highlighting are Java based files (*.java, *.groovy..etc), other file types work as described.